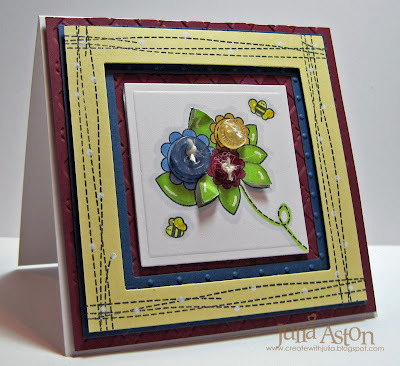 What a fun new technique challenge Joan had for us over on Split Coast this week! 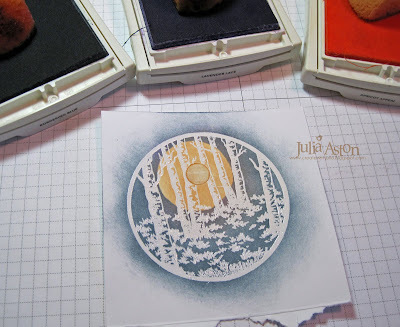 For all those large stamps that are hard to ink up and get good stamping coverage - Joan devised a way to ink it so it looks like plaid and the multicolored inking makes missed spots unnoticeable! 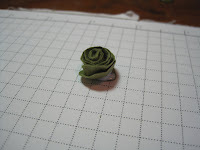 You can find Joan Ervin's tutorial for this plaid silhouette technique on her blog here. The first time I 'plaid' inked my chair - just inking it from top to bottom- the chair details disappeared and all you could see was the plaid. So then I tried to 'selectively' ink the top, arms, cushions and bottom to give each section definition. 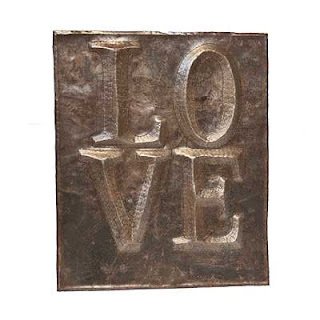 I embossed a rectangle nestability first - then stamped the sofa and sentiment. Then I added two pewter pearls to the arms. My stuffed sofa is from A Stamp in the Hand and my sentiment is from Waltzingmouse. 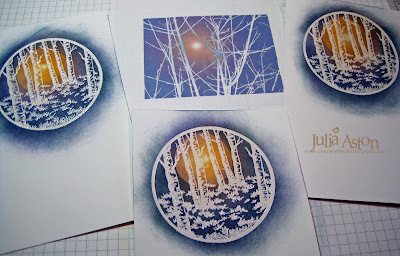 Several people have left me comments when I do embossed frames with my Nestibilities asking how I do it. So I took pictures as I made the frame for this card. 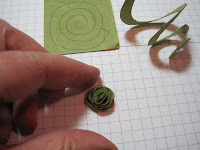 This is my 'sandwich' of layers from left to right - I'm using a Cuttlebug here. 1) First you have the A plate on the Cuttlebug. 4) place the rubber mat on top of this B plate. 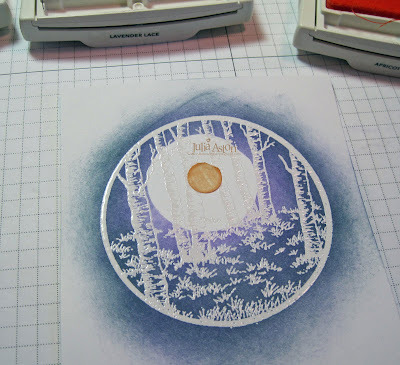 Then you take your card stock - Either a panel or the card itself depending on where you are embossing. 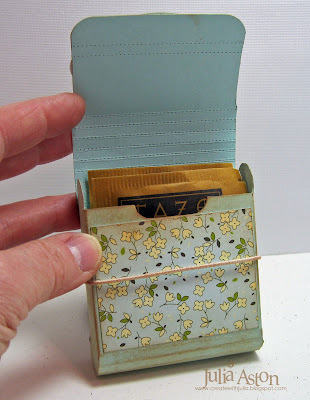 If you are doing it directly on the card like I did - you want to fold your card - open it up and place the Nestability die on the inside of the card. This results in a raised frame. 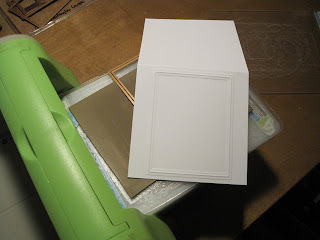 If you emboss from the front of the card - the frame will be depressed. Try out each way to see which you prefer! 7) run it through the Cuttlebug. Here's the sandwich being run through. And, Voila! a beautiful embossed frame. 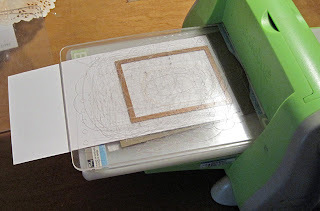 I always emboss first and stamp after to be sure I get my image centered within the frame. I hope this is helpful to you - I'm sure there are other 'sandwiches' out there - but this is how I do mine! 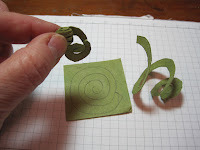 Practice with scraps to see how it comes out - you may need to adjust your # of pieces of card stock in your 'buffer' depending on how thick they are. It shouldn't be too hard to roll it through your Cuttlebug - but it can't be too easy either - then it doesn't emboss deeply! And just a reminder about the Waltzingmouse Sketch Challenge here and the Friends of WMS blog waltz coming up here! 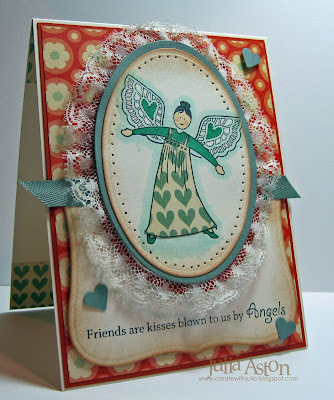 Today's color challenge on Split Coast was to use Coral, Turquoise, Ruby Red and the 'dessert' option of using Ric Rac. I got it all on to my card today! 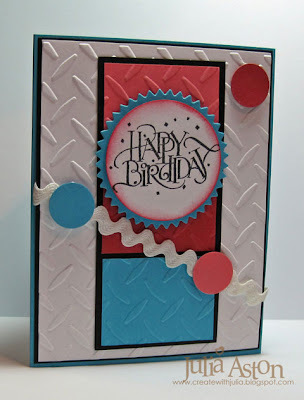 I made a masculine b'day card using Mercy's Tuesday Sketch and the Diamond Plate Cuttlebug embossing folder. I added the ric rac on a diagonal and popped a few colored circles on it to draw your eye around the card. 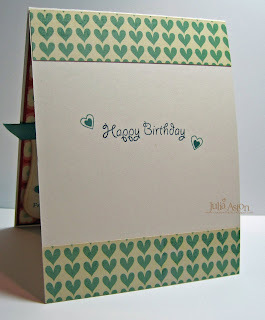 I made this cute top note card for the Featured Stamper Challenge this week over on Split Coast. I had never been in Beedubya's gallery before and there were lots of fun things to see in there! 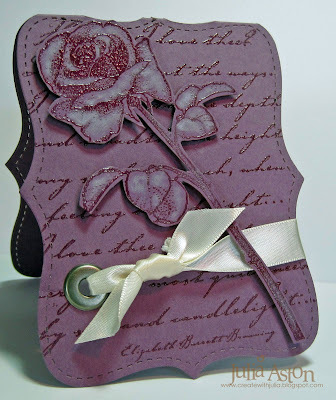 I clear embossed both the background text and the rose. 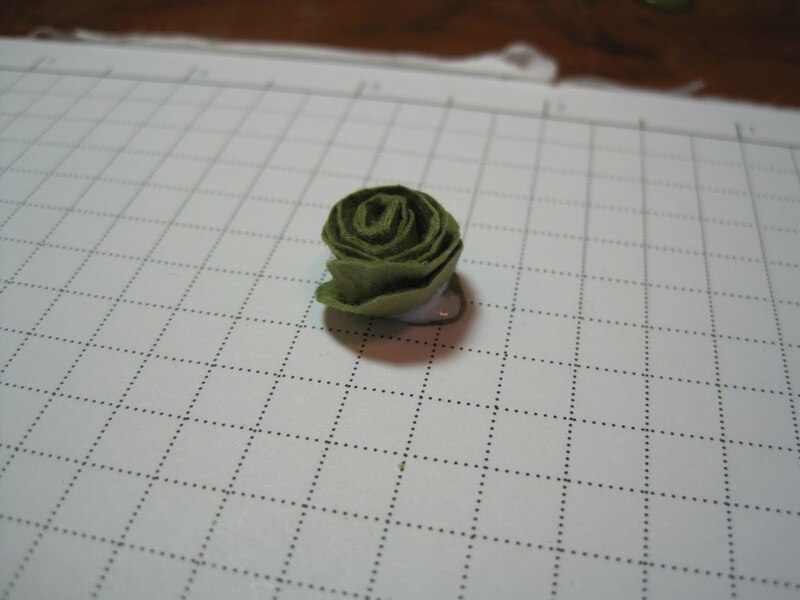 I cut out the rose close to the edge and added a little bit of white color with white craft ink. It's popped up over the text with foam dimensionals. 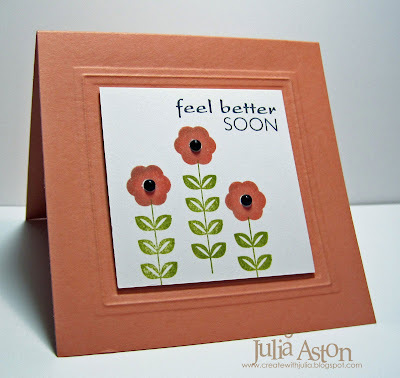 The card is cut with the Top Note Die from Stampin Up. 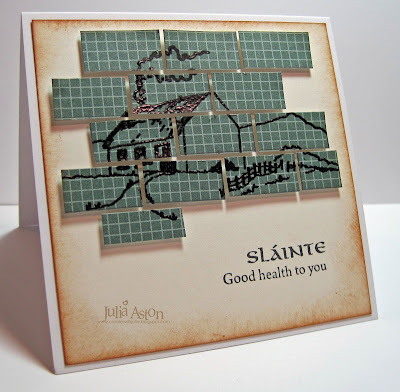 Be sure to check this post: you could win a WMS stamp set by leaving a comment! you have until Sunday night at 11:59 PM EST. 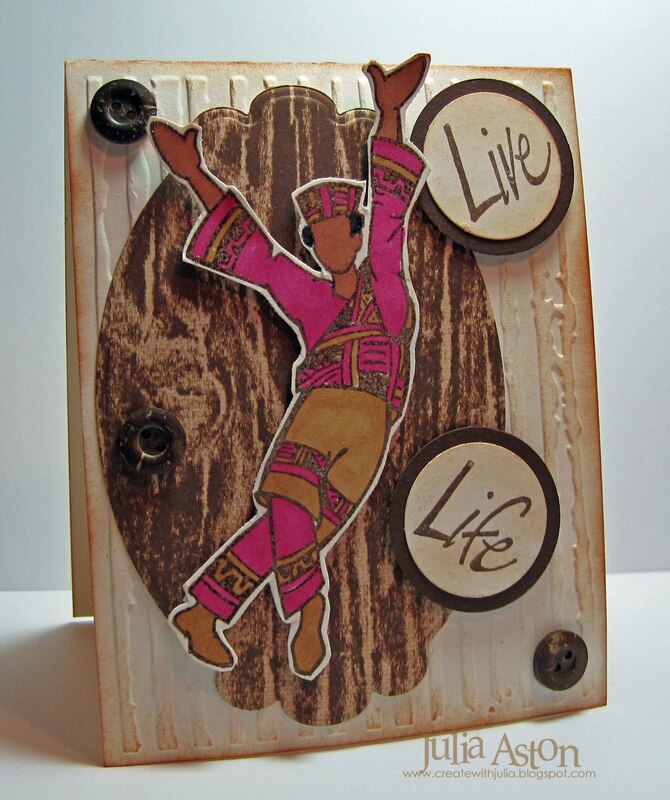 The Featured Stamper over on Split Coast was the very artful Mutnik (Cathy)! 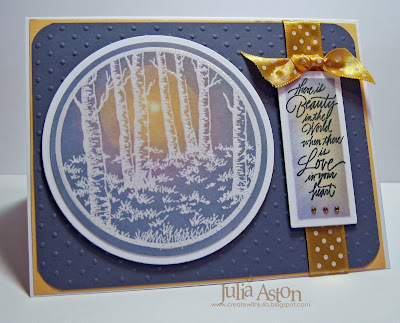 I CASE'd her birch trees with birds card. 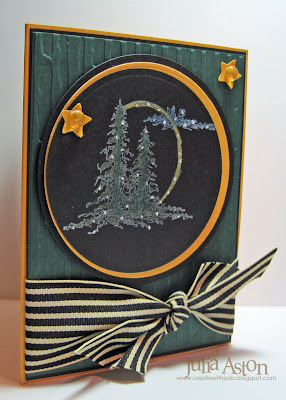 I changed stamps used circles instead of rectangle framings and used striped ribbon instead of striped DP but kept the tree theme and used the black magic technique. 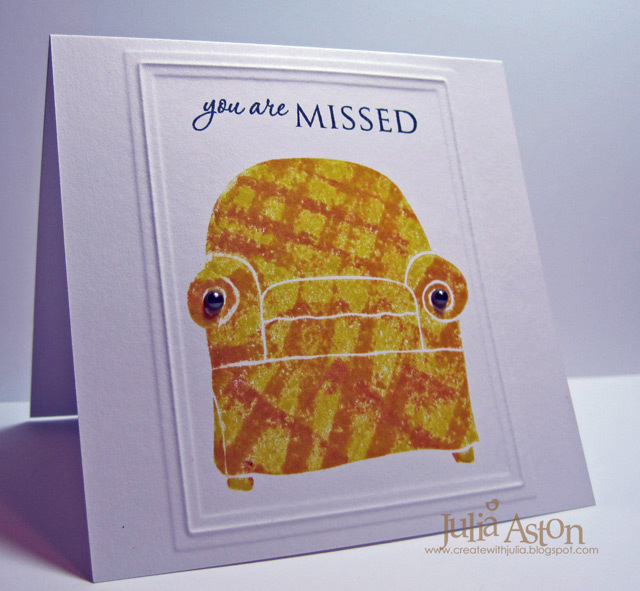 The background is embossed with the Distressed Stripes Cuttlebug folder. 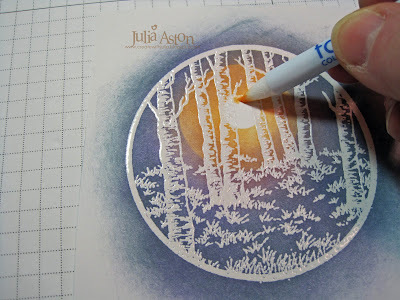 I stamped the image with white chalk ink - then colored over parts of it with colored pencils (the Black Magic Technique) and added highlight dots with a white gel pen. Dave is having a great sale over at Rubbernecker Stamps until midnight Wed March 24th - 15-28% off on selected items from Ranger, Spellbinders, Tsukineko and Clearsnap! - so be sure to check it out before it's over! This is the image that first attracted me to Mo's Digi Pencil - Mummu is her name and I would absolutely LOVE to meet her in person - wouldn't you!?! You can tell that she is a free spirit -a flower child - with her braided hair, her leather sandles and peasant skirt! 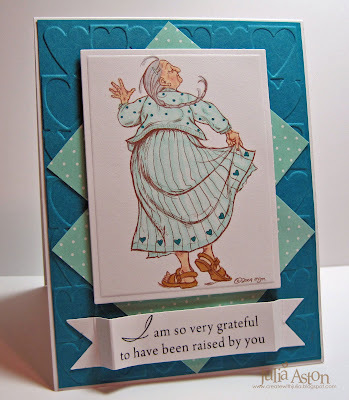 I made this card for Mo's Digi Pencil Challenge #20 which is a sketch challenge. I colored Mummu with Copics. 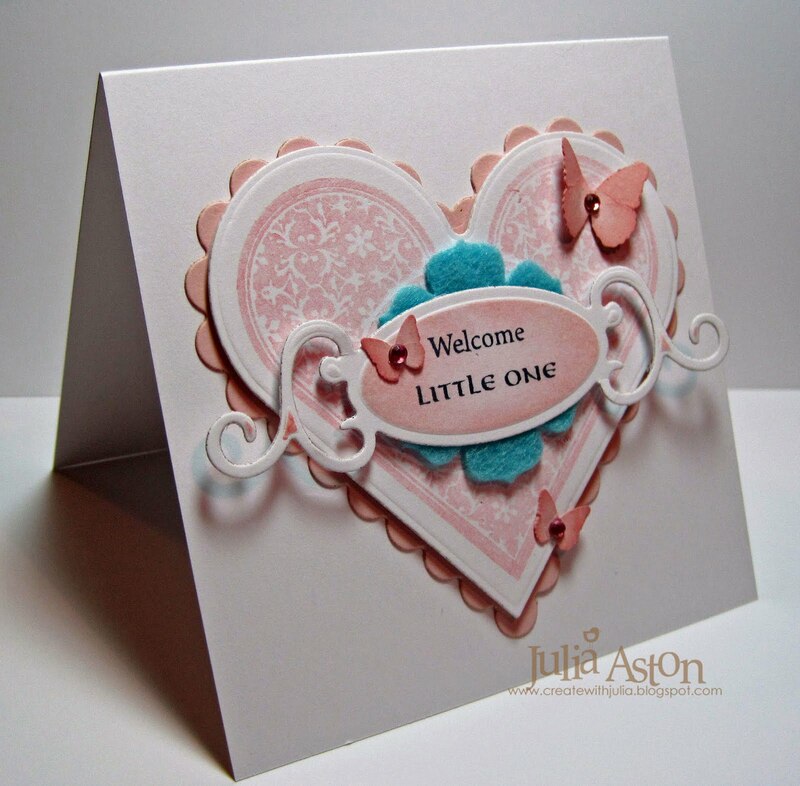 The background is embossed with the Hearts Block Cuttlebug folder. They have challenges every Thursday over at Mo's Challenge blog so be sure to check them out! 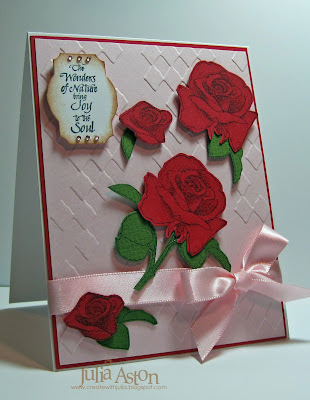 The sentiment on my card is from the Roses Set by Waltzingmouse Stamps. 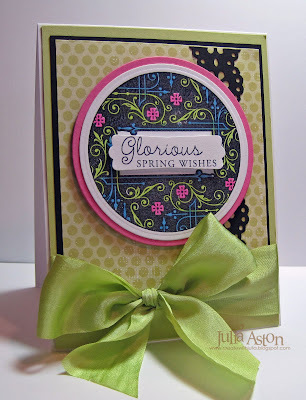 Just a reminder to check out the Waltzingmouse color challenge over at Stamping Around - someone's going to win the Spring Baskets stamp set! 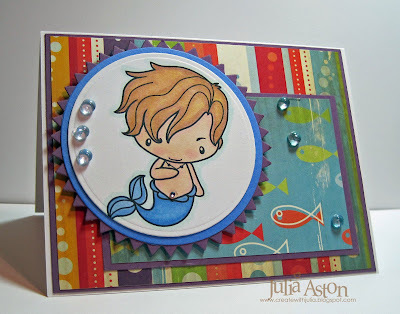 Jovial Judi was the Featured Stamper on Split Coast last week whoo hoo Judi! Big congratulations! I chose her Allergo sketch card to CASE because I was drawn to the silhouette stamp and the layout of the card. 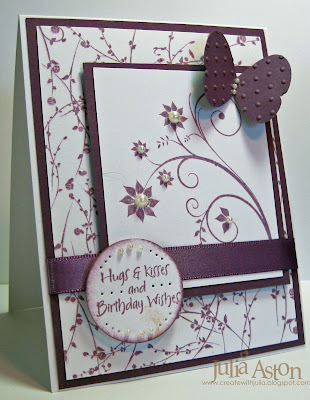 You have to change things when you CASE a card - so I used different colors and stamps, added a sentiment and butterfly. I added sticky pearls to the flowers, butterfly and sentiment. 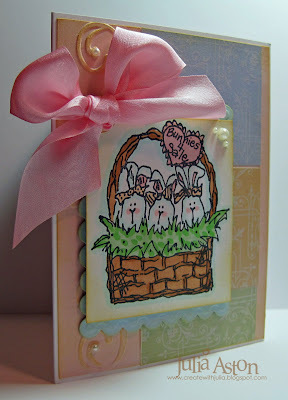 We've got a Waltzingmouse DT blog hop tomorrow - the day of Claire's release of 3 super stamp sets - Labels Three, Roses and Nestie Eggs. 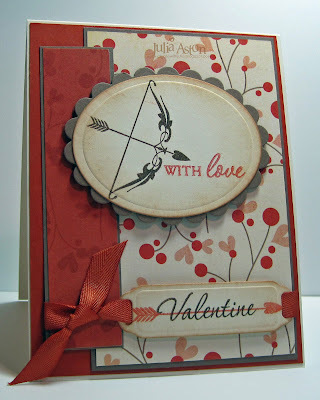 You will have the chance to win 2 stamp sets by leaving comments so be sure to stop by and check it out ! 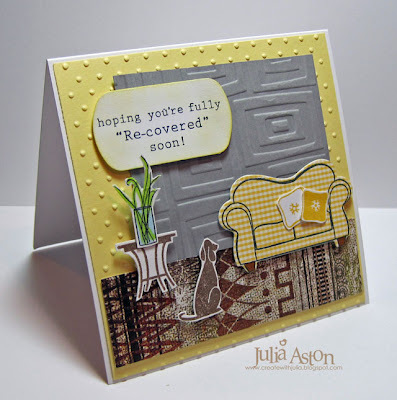 Claire , Belinda and Jennifer have sneak peeks today! 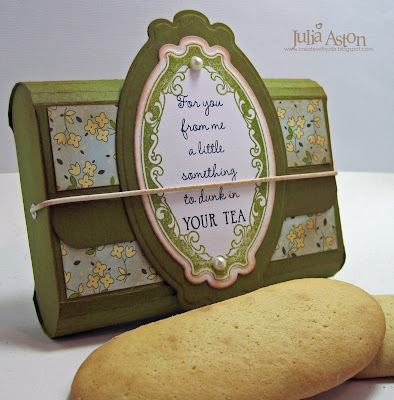 A Glorious Waltzingmouse Blog Hop - and a chance to win 2 sets! 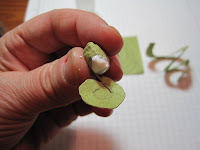 You should start the hop at Lynn's blog. If you came here from Laurie's blog you are in the right spot! 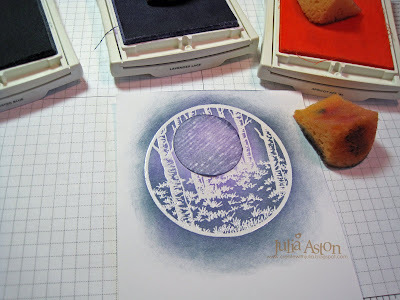 For my card today I used this beautiful circle stamp from the new set Vintage Circles Small. 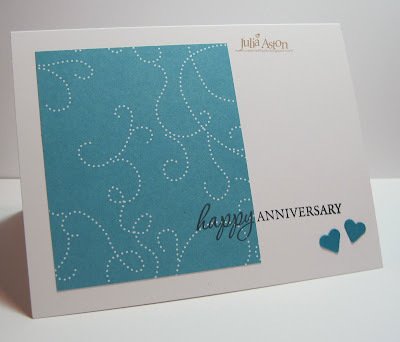 I stamped it using Versamark and black ink and then embossed it with clear embossing powder. I colored in the filigree design with copics. I think it looks like a lovely stained glass window don't you? The sentiment is from the new set Spring Baskets. 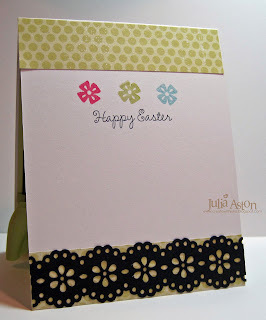 On the inside of my card I stamped 'Happy Easter' (Spring Baskets) and then three little flowers from the Vintage Circles Small set matching the colors to those used on the front. There are two stamps sets up for grabs today! How can you win them you ask??? 1) One winner will be drawn from comments left on one of the Design Team's blogs -whose blog?? We don't know!! So be sure to leave a comment on each blog!!! This winner will receive the Spring Baskets Set!! 2) The 2nd winner will be drawn from comments left on Claire's blog and that set will be Lil Buddies! 3) You must post your comment by 11:59 pm EST Sunday, February 7th. Winners will be announced on Claires blog on Monday Feb 8th. 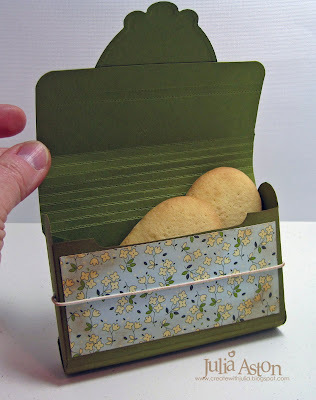 So leave me a comment here and then scoot on over to Jennifer's blog to continue on the hop! 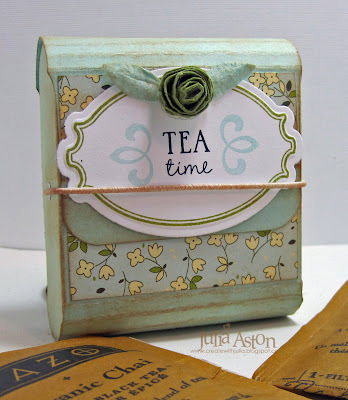 Stamps: Waltzingmouse Stamps - Vintage Circles Small, Spring Baskets.